Is it the first time that you are hosting a website or do you have prior experience in hosting websites? In both scenarios, your choice of hosting for your site depends on the nature and purpose of the site’s usage. You need to be clear about your budget and traffic requirements. Only then can you choose a cheap hosting plan, while keeping the option to scale up later. One thing is sure; there is no ideal web host for everyone. You may find one hosting provider to be better for your current requirements, while someone else might not find it suitable for theirs. So, we compare two well-known and reliable web hosting companies, namely Bluehost and DreamHost, in detail by considering their features, pricing and years of experience. The aim is to help you consider the various advantages of selecting one over the other. This will, in turn, enable you to make the right decision based on your current requirements. DreamHost is a privately owned company and Bluehost is owned by the Endurance International Group (EIG). Both were founded in 1996 and they thus both has ample experience. Apart from web hosting, DreamHost also offers plenty of other services, such as cloud computing and cloud storage. They’re also a good alternative to EIG brands. However, Bluehost focuses mainly on web hosting services. Let’s compare Bluehost’ and DreamHost’s various important hosting features, such as uptime, performance and customer support. Bluehost does not make any claim of uptime guarantee but provides an actual uptime percentage of approximately 99.9%. Thus, you get a significantly higher availability of your hosted website with Bluehost. DreamHost claims to offer a 100% uptime guarantee but delivers an uptime similar to Bluehost. So, there is no difference between the two. The page load speeds offered by both web hosts are extremely fast and you will be satisfied with the overall server response speed for quick navigation on your website. DreamHost uses SSDs that improve website page speeds tremendously compared to SATA disk drives. Both hosting service providers deliver strong performance for your websites, which is a major reason for both being considered reliable web hosts for many years now. Bluehost has added some innovation through the use of CPU segregation technology that allows it to intelligently control the CPU and protect your hosted site from spammers, viruses and so on. Any good hosting company will always give top priority to customer satisfaction and focus greatly on their customer support services. The same holds true for both Bluehost and DreamHost. Both web hosts offer round the clock support to their customers, via phone, email and live chat. They also have online forums for customer discussions about their various hosting plans, about issues, for knowledge sharing, etc. DreamHost offers you access to its web hosting manual that comprises plenty of how-to articles, troubleshooting guides, tips and tricks, and so on. Bluehost also allows you to raise tickets to get in touch with its support. However, in both cases, it is always better to contact the web host via live chat or telephone for a quick response. There is no clear winner here since both offer pretty good customer assistance. Bluehost provides you with the industry standard cPanel that is extremely user-friendly. The best thing about this control panel is that you will likely find this panel easy to operate if you have already hosted a website before. Even newbie webmasters would quickly be able to start using cPanel. It is also very flexible and allows you to seamlessly manage and transfer files, manage backups, install programs, create databases and so on. DreamHost offers its own proprietary (bespoke) control panel, which is a little difficult to get used to. However, both control panels offer smooth FTP access for file transfer, one-click installation of WordPress, unlimited MySQL databases for every website, cron jobs to schedule repetitive tasks and more. Bluehost is the winner here as it offers cPanel, which is easy to use. Bluehost offers a money back guarantee for 30 days from the day you purchase your preferred hosting plan. DreamHost offers this guarantee for a period of 97 days. So, they will return your money if you cancel your DreamHost hosting plan within the first 97 days, minus any domain registration charges. Thus, DreamHost is the clear winner here, since it offers twice as long a time for you to decide if the hosting plan fulfils your requirements. You get the chance to claim your free domain name when you enrol for any Bluehost or DreamHost hosting plans. With the shared hosting plans for DreamHost, you are also entitled to free domain privacy protection. Bluehost offers you automatic backup services on a weekly basis at no additional costs, while DreamHost provides automatic backup services only for their WordPress hosting plan. For other hosting plans with DreamHost, you get the manual backup option from your control panel. If you already have a website and want to move it to a new account, Bluehost offers special migration services for the whole migration process at just $99.99. DreamHost does not offer services such as this. The lowest price for any Bluehost hosting plan is $2.95 per month (for the Bluehost starter shared hosting plan with a three-year subscription). The cheapest price for a DreamHost hosting plan is $8.95 per month (for a shared hosting plan with a two-year subscription). But, DreamHost is currently offering a 40% discount and so this plan is available at $5.95 per month at the moment. However, these two plans cannot be compared to one another, as DreamHost provides all the advanced features for shared hosting in a single plan, while Bluehost offers those features in the more premium versions of shared hosting plans which are also highly priced. So, if you are a new webmaster looking for a cheap web host for the initial period (before your website starts getting more traffic), then Bluehost is more suited to you as it offers cheaper hosting options. Bluehost does not provide you with the flexibility to subscribe to any of their shared hosting plans for a short term. You can only opt for the one-year, two-year or three-year subscription alternatives, however, they do accept Paypal, unlike Dreamhost. With DreamHost, you get the option to subscribe to its shared hosting plan on a monthly basis, apart from the annual subscription or bi-annual subscription options. While Bluehost offers three shared hosting plans, DreamHost only has one option for shared hosting. Neither hosting service provider charges setup fees. With DreamHost, you can choose the entire configuration that you wish to have with your dedicated server hosting plan. The basic dedicated hosting plan for DreamHost starts at around $149 per month (annual subscription) or $169 per month (monthly subscription). Clearly, you get the flexibility to choose better configurations with DreamHost than with Bluehost as far as dedicated server hosting is concerned. Verdict – Who wins? Bluehost or Dreamhost? 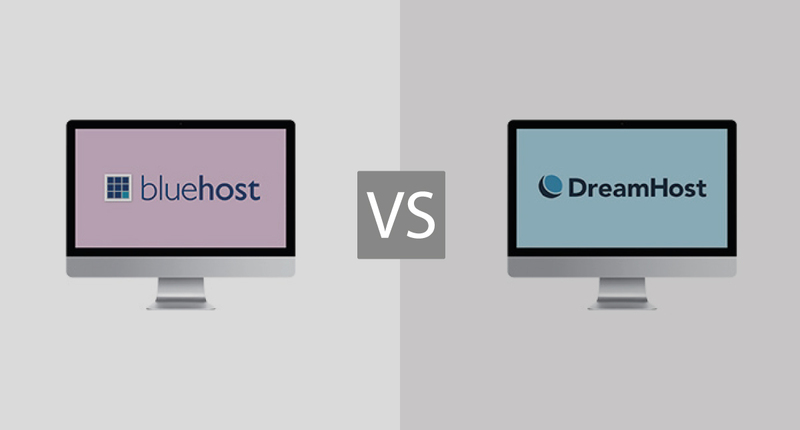 Based on the above comparison of the various hosting features offered by Bluehost and DreamHost, it may seem that Bluehost has a slight advantage over DreamHost. You may prefer Bluehost for its flexible control panel, scalability option with shared hosting plans, automatic backups, and migration services. Similarly, you may opt for DreamHost; if you want more flexibility for your dedicated server configuration, domain name privacy protection, and long money back guarantee period, SSDs and so on. As mentioned earlier, there is no one-fit solution for all your hosting requirements. You need to understand your hosting needs and do thorough research of the hosting features offered by the two web hosts. We hope that this review of Bluehost and DreamHost proves useful for you during your selection of your ideal web host. For more information on other dedicated hosting providers, have a look at our best dedicated servers guide. Please share your opinion about your preferred web host of the two with us.